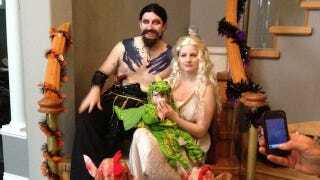 In an alternate universe, Daenerys Targaryen and Khal Drogo moved to the suburbs, where they lived happily ever after with their three dragon babies. A crew of family cosplayers brings that universe to life — just with costumed toddlers in lieu of actual (or CG) dragons. According to my three year old son, the kids were dragons, Mommy was a princess and Daddy was "a scary". The kid might be a little young to understand all the forced marriage and blood magic, but you know what they say: the family that cosplays together stays together.